I've had the past week off, so I know you're all expecting me to show oodles of projects, but that's not what happened. I didn't have that many to work on (I know I have all those new fabrics, but I'm waiting for the right project to find me) and I also spent time with kitties, cooking (remember last vacation I refused to cook? ), watching a few movies and generally taking it easy. I was headed for the bench where the dolly quilt parade took place and saw these old rickety steps with grapevines all over them and it screamed "PHOTOGRAPH!" and I'm working on getting better pictures, so I stopped. I really like it. The pattern was inspired by an ad in a magazine for a baby quilt. You can get the pattern here, though I made it smaller. It's called "Sweet Baby" by Susan Branch. It finished about 24" square. And then I started a second dolly quilt. 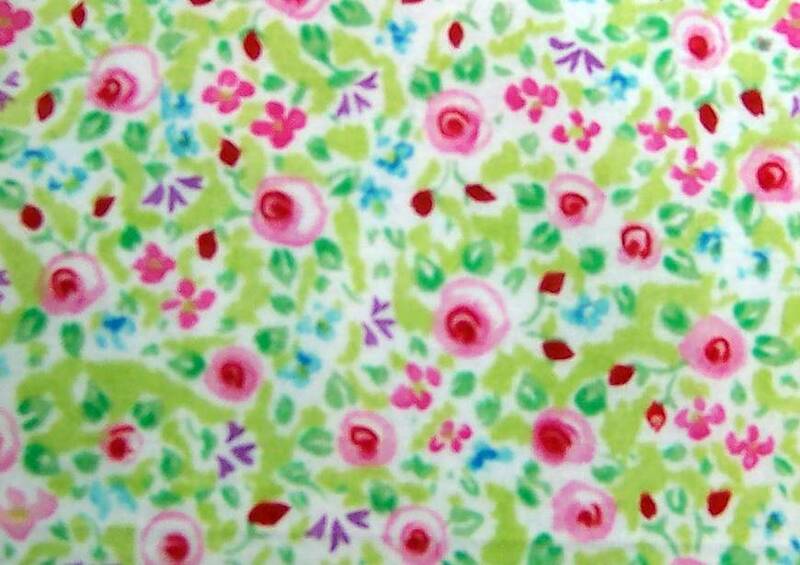 My mom gave me this fabric when I was looking for something to border the May quilts with. Since this started it, I decided whatever quilt I used wouldn't count as "from my stash," as my goal is for the dolly quilts. So I went ahead and started a second dolly quilt this month. There wasn't much and I wanted to sash with it, but it was either sashing or borders. I opted for borders, but haven't gotten them sewn on yet. I wish it played a more prominent role because it's such a sweet print, but there was maybe a fat quarter. The pattern was inspired by this one that Beth made a few months back. I realize now that I didn't quite do it "right," but that's what happens when you do it from memory... I like it anyways. I've run out of leftover batting, so you might not see this one officially finished for a while. 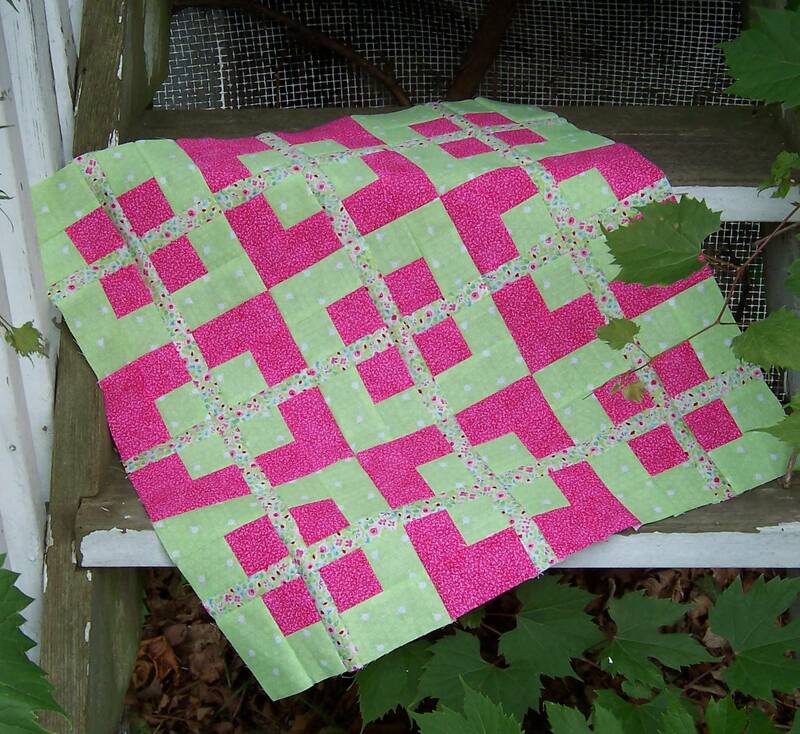 I've also run out of just about every pink you see in both quilts. Some pieces in that first one were enough for just one or two sashing strips only! But I really like the overall look. 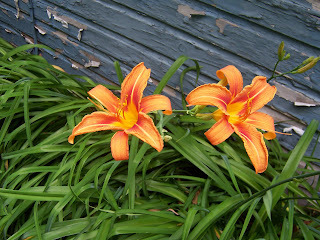 Last, one picture of what is blooming in my yard. These came with the house and no matter how much my mom tells me they're not fancy enough for her, I love them. It makes me wonder what farm wife lovingly dug these up 100 years ago and transplanted them to beautify her yard by planting them along the back of the house and side of the garage. Maybe it wasn't that long ago, but they were well established by the time we bought the house. PS I lied. I have on more picture. The kitties have an outdoor enclosure and today, after 3 years of expecting this, Skitter (my neurotic kitty, who I never expected this from) came in the house with a chipmunk. Then she let it go. 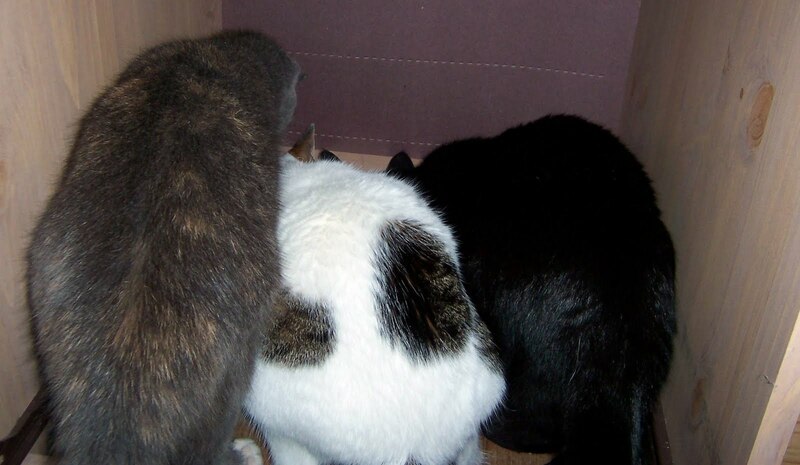 Here are Lexie (grey), Emma (white) and Tucker (black) helping keep it cornered...Skitter was up napping by then and Luka had tired of poking at it. I don't think any of them realized it was FOOD! It ran behind my desk, so I took out the file cabinet drawer and that's where they all are. And yes, I would have let them eat it if they had killed it. Worm pills aren't that expensive and Skitter is the only one I have trouble giving them to. They're exclusively inside kitties (their enclosure is currently escape-proof, as Lexie-Houdini can tell you) so this was fun. The hubby and I ended up rescuing it (they tired of it after they couldn't fish out after an hour or so) and letting it go back outside. I bet that little guy won't make that mistake again! PPPS I've got giveaway goodies ready, so look for the giveaway post itself soon! June's installment is fabulous! The mixed sashings are wonderful and your photograph looks like the best from a magazine. Great job, Katie! I would have thought you had a year's worth of dolly quilts by now... You really should submit this one to a magazine; it might get picked for publication! Not a chipmunk---no, no, no! Mine hasn't come back this year. Teach them to catch mice! As usual, your dolly quilts are adorable. All the little ones who receive the dollys and quilts are going to be thrilled! 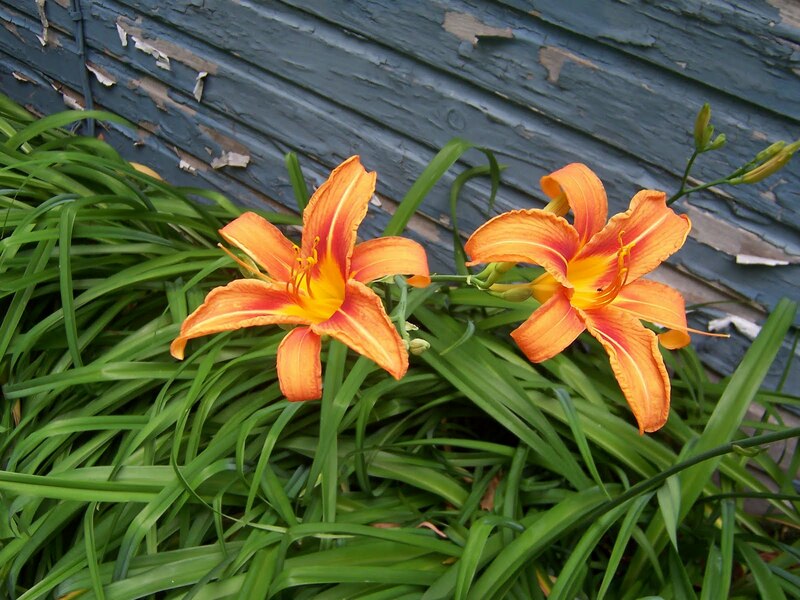 When I lived in Illinois I had bunches of the tiger lillies around my yard but it was a very shady area and they didn't bloom well. I did dig them all up and plant shade loving plants in their place. My girlfriend took them and planted them in her back yard so they didn't go to waste. Yeah for the kitties and their big catch. For indoor kitties, that must have been very exciting! I will be watching for the goodies giveaway! You HAVE been a busy girl! 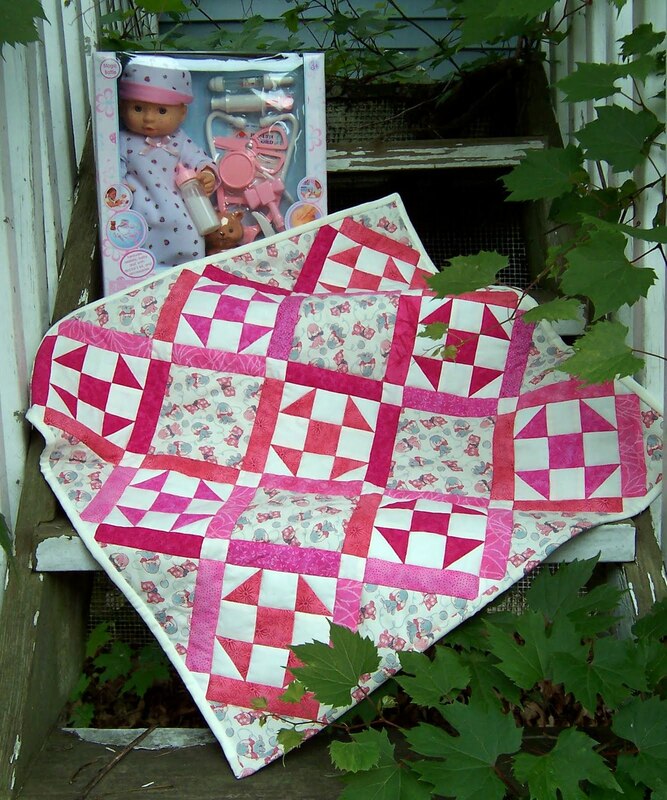 All those doll quilts are so pretty; some little girls will be thrilled with them! I'm surprised the kitties didn't make hash out of the chipmonk! I've enjoyed every word and picture in your great blog! Glad you enjoyed your vacation! 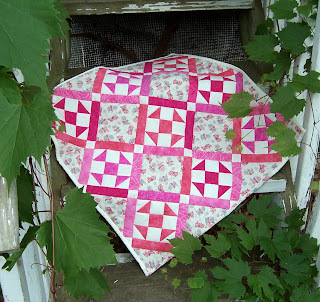 ---"Love"
Your dolly quilts are adorable just as the rest of themn have been. You did a great job reproducing the birthday presents block. Looks really cute scaled down. I did not know you had so many cats! I thought my sister had the record. LOL. I love that picture of them. Made me smile thinking about them and the poor little chipmunk. My dogs are westies which were bred for hunting rodents... we had a mouse in the house a while ago. They looked at it. That's it, just looked. Didn't even try to catch it or play with it...nothing. So much for breeding hu? Silly dogs. Your doll quilts are wonderful. I really like the green and pink one. I must start doing some dolly quilts. How big do you make them? Kitties are great. I only have one left and she's my 16 year old neurotic. Wakes me up every morning around 4AM, howling. Then when I get up, she falls asleep. Door bell rings and you don't see her for 8 hours. Love the doll quilts. The colors are wonderful. Katie, your latest batch of doll quilts is sensational. I love the creative use of mixed pink sashings in the first quilt, but my favourite is the second -- pink and green is such a great combination. We don't have chipmunks, just lots of very cheeky squirrels that my dogs like to chase. All of your doll quilts are cute! Poor chipmunk, I can just here him telling his friends about his "near death experience", LOL! The kitties look very intent. Oscar gets that way when he is chasing bugs around the house as they get they through the screen door sometime's. I have had to rearrange my breakables to facilitate him not becoming dead for tearing through the house in persuit.